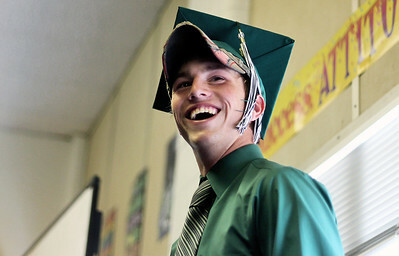 Sarah Nader - snader@shawmedia.com Nicholas Nelson, 18, of Hebron wears a hat under his graduation cap before the 2012 Alden-Hebron Commencement in Hebron on Sunday, May 20, 2012. 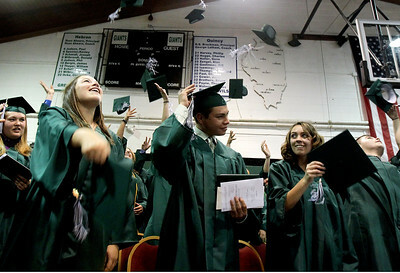 Sarah Nader - snader@shawmedia.com Hebron graduates throw up their caps during the 2012 Alden-Hebron Commencement in Hebron on Sunday, May 20, 2012. 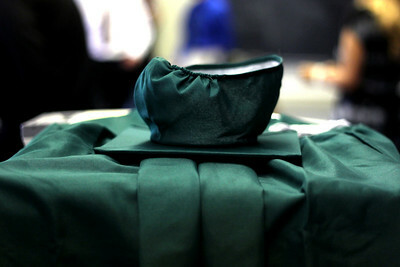 Sarah Nader - snader@shawmedia.com A cap an grown is placed on a table before the 2012 Alden-Hebron Commencement in Hebron on Sunday, May 20, 2012. 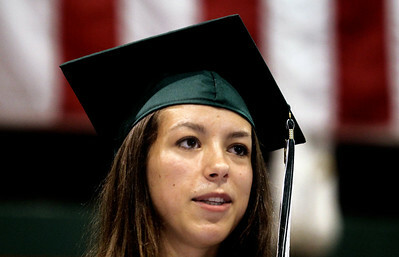 Sarah Nader - snader@shawmedia.com Valedictorian Samantha Beck speaks during the 2012 Alden-Hebron Commencement in Hebron on Sunday, May 20, 2012. 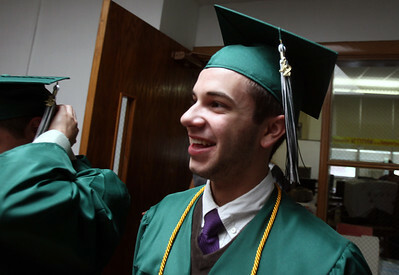 Sarah Nader - snader@shawmedia.com Salutatorian David Mor, 17, of Richmond lines up before the 2012 Alden-Hebron Commencement in Hebron on Sunday, May 20, 2012. Mor plans to study acting at the University of Illinois this fall. Sarah Nader - snader@shawmedia.com Alexia Wanderer (right) 18, of Hebron hugs her best friend, Melanie Winter, 19, of Woodstock after the 2012 Alden-Hebron Commencement in Hebron on Sunday, May 20, 2012. Sarah Nader - snader@shawmedia.com Students are seated during the 2012 Alden-Hebron Commencement in Hebron on Sunday, May 20, 2012. 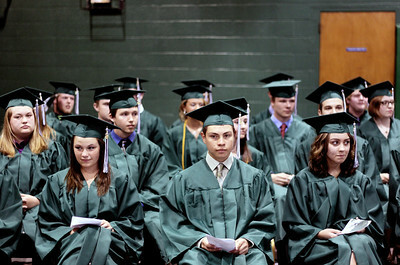 Students are seated during the 2012 Alden-Hebron Commencement in Hebron on Sunday, May 20, 2012.